PUMA headquarters in Herzogenaurach, Germany. PUMA has been a public company since 1986, listed at the Frankfurt Stock Exchange. Since 2007 PUMA has been part of French group Kering (formerly known as Pinault-Printemps-Redoute or PPR). Since 1 July 2013, the company has been led by former football professional Bjørn Gulden (CEO). As of 2016, PUMA SE employs more than 10,000 people worldwide and distributes its products in more than 120 countries. PUMA offers products for Football, Running, Training and Fitness, Golf, Motorsports and LIfestyle. In the past, it sponsored a number of legendary athletes, including Pelé, Eusébio, Johan Cruyff, Diego Maradona, Clyde Frazier, Lothar Matthäus, Boris Becker, Martina Navratilova, Linford Christie, Colin Jackson, Heike Drechsler and Michael Schumacher among others. Currently, international footballers Sergio Agüero, Antoine Griezmann, Marco Verratti, Yaya Touré, Olivier Giroud, Gianluigi Buffon and Marco Reus are sporting PUMA football boots. It also has the world’s fastest man and Jamaican track athlete Usain Bolt under contract. In terms of football clubs, PUMA sponsors Arsenal FC and Borussia Dortmund National football teams Italy, Switzerland, Austria, Ivory Coast, Ghana and Uruguay and Olympic Handball Champion Denmark are also endorsed. In Track & Field, PUMA sponsors the Jamaican, Cuban, and Barbados Athletic Associations. In order to support its women’s business, PUMA endorses fashion icons Rihanna and Kylie Jenner. In December 2014, Rihanna was also named Creative Director, overseeing direction of the womenswear line in December 2014. Puma has also named the Korean boy group, BTS, as ambassadors of the company. The group has shot several commercials, advertising shoes and clothing for the company. Christoph von Wilhelm Dassler was a worker in a shoe factory, while his wife Pauline ran a small laundry in the Franconian town of Herzogenaurach, 20 km (12.4 mi) from the city of Nuremberg. After leaving school their son, Rudolf Dassler, joined his father at the shoe factory. When he returned from fighting in World War I, Rudolf was trained as a salesman at a porcelain factory, and later in a leather trading business in Nuremberg. In 1924, Rudolf and his younger brother, Adolf, nicknamed "Adi", founded a shoe factory. They named the new business "Gebrüder Dassler Schuhfabrik" (Dassler Brothers Shoe Factory) which was the only business at the time that manufactured sports shoes. The pair started their venture in their mother's laundry. At the time, electricity supplies in the town were unreliable, and the brothers sometimes had to use pedal power from a stationary bicycle to run their equipment. In 1927, they moved into a separate building. Both brothers joined the Nazi Party, but Rudolf was slightly closer to the party. A growing rift between the brothers reached a breaking point during a 1943 Allied bomb attack. Adi and his wife climbed into a bomb shelter that Rudolf and his family were already in. "Here are the bloody bastards again," Adi remarked, apparently referring to the Allied war planes, but Rudolf, due to his apparent insecurity, was convinced his brother meant him and his family. When Rudolf was later picked up by American soldiers and accused of being a member of the Waffen SS, he was convinced that his brother had turned him in. After increasingly different views of how to run the business, the brothers split the business in 1948. Rudolf moved to the other side of the Aurach River to start his own company. Adolf started his own company using a name he formed using his nickname—Adi—and the first three letters of his last name—Das—to establish Adidas. Rudolf created a new firm that he called "Ruda", from "Ru" in Rudolf and "Da" in Dassler. A few months later, Rudolf's company changed its name to PUMA Schuhfabrik Rudolf Dassler in 1948. PUMA and Adidas entered a fierce and bitter rivalry after the split. The town of Herzogenaurach was divided on the issue, leading to the nickname "the town of bent necks"—people looked down to see which shoes strangers wore. In 1948, the first football match after World War II, several members of the West German national football team wore PUMA boots, including the scorer of West Germany's first post-war goal, Herbert Burdenski. Rudolf developed a football boot with screw-in studs, called the "SUPER ATOM" in collaboration with people, such as West Germany’s national coach Sepp Herberger. At the 1952 Summer Olympics, 1500 metres runner Josy Barthel of Luxembourg won PUMA's first Olympic gold in Helsinki, Finland. At the 1960 Summer Olympics PUMA paid German sprinter Armin Hary to wear PUMAs in the 100 metre sprint final. Hary had worn Adidas before and asked Adolf for payment, but Adidas rejected this request. The German won gold in PUMAs, but then laced up Adidas for the medals ceremony, to the shock of the two Dassler brothers. Hary hoped to cash in from both, but Adi was so enraged he banned the Olympic champion. PUMA became a public company in 1986, and thereafter was listed on the Börse München and Frankfurt Stock Exchange. In May 1989, Rudolf's sons Armin and Gerd Dassler agreed to sell their 72 percent stake in PUMA to Swiss business Cosa Liebermann SA. For the fiscal year 2003, the company had revenue of €1.274 billion. PUMA were the commercial sponsors for the 2002 anime series Hungry Heart: Wild Striker, with the jerseys and clothing sporting the PUMA brand. PUMA ranks as one of the top shoe brands with Adidas and Nike. In February 2007 PUMA reported that its profits had fallen by 26% to €32.8 million ($43 million; £22 million) during the final three months of 2006. Most of the decline in profits was due to higher costs linked to its expansion; sales rose by more than a third to €480.6 million. In early April 2007 PUMA's shares rose €29.25 per share, or about 10.2%, at €315.24 per share. On 10 April 2007 French retailer and owner of Gucci brand Pinault-Printemps-Redoute (PPR) announced that it had bought a 27% stake in PUMA, clearing the way for a full takeover. The deal values PUMA at €5.3 billion. PPR said that it would launch a "friendly" takeover for PUMA, worth €330 a share, once the acquisition of the smaller stake was completed. The board of PUMA welcomed the move, saying it was fair and in the firm's best interests. As of July 2007 PPR owns over 60% of PUMA stock. In July 2011 the company completed a conversion from an Aktiengesellschaft (German public limited company) to a Societas Europaea, the European Union-wide equivalent, changing its name from PUMA AG Rudolf Dassler Sport to PUMA SE. At the same time, Franz Koch replaced the long-serving Jochen Zeitz as the firm's CEO, with Zeitz becoming chairman. The company has been led by former football professional Bjørn Gulden (CEO) since July 1, 2013. 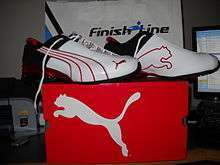 PUMA is the main producer of enthusiast driving shoes and race suits. They are the primary producer for Formula One and NASCAR clothing. They won the rights to sponsor the 2006 FIFA World Cup champions, the Italian national football team, making and sponsoring the clothing worn by the team. They entered a partnership with BMW, Ducati and Ferrari to make PUMA-Ferrari, PUMA-Ducati and PUMA-BMW shoes. On 15 March 2007 PUMA launched its 2007/2008 line of uniforms for a club, and Brazilian football club Grêmio will be the first to use the laser-sewn technology, similar to that worn by Italy at the 2006 World Cup, because their season starts six months earlier than European clubs. Rihanna was named Creative Director of PUMA overseeing direction of the womenswear line in December 2014. As of 2014, PUMA SE employs more than 10,000 people worldwide and distributes its products in more than 120 countries. In 2008, PUMA commemorated the 40th anniversary of the "King" model of boots with a special anniversary edition, the King XL (XL is 40 in Roman Numerals), a tribute to Portuguese footballer Eusébio, who scored 42 goals with King boots in 1968, winning the Golden Boot Award as Europe's leading scorer. PUMA has continued to release new versions of the King range, and released a version in 2009 to celebrate the history of Italian soccer, and in particular the PUMA King XL Italia, in honour of double World Cup winning coach Vittorio Pozzo. In 2010, a PUMA King model was released commemorating the 50th birthday of Diego Maradona, with a model called the PUMA King Diego Finale football boot. This edition was created in the colours of La Albiceleste, the Argentina National football team. Organizations that were promoting fair trade and worker's rights did not criticize PUMA's employment practices in their developing world factories, predominantly relating to workers in China, Turkey, El Salvador, and Indonesia. The company has made some steps towards greater transparency. In 2000 PUMA began auditing all of its suppliers on a yearly basis, and makes the results available in its sustainability reports. Since 2005 it has publicly provided a list of its suppliers. PUMA has made a strong commitment to respecting workers rights in some areas. For example, PUMA has obtained the Ethical Clothing Australia accreditation for its Australian-made products. This labour-friendly accreditation applies to only a tiny percentage of PUMA’s total production. In May 2011, The Guardian released an article saying that PUMA was "world's first major company to put a value on its environmental impact". According to the article the company "has made a commitment that within four years, half its international collections will be manufactured according to its internal sustainability standard, by using more sustainable materials such as recycled polyester, as well as ensuring its suppliers develop more sustainable materials and products." PUMA goalkeeper gloves and PUMA motorsport gloves. a style introduced in 1968. PUMA outlet in Hong Kong. 1920: Rudolf Dassler and his brother Adolf start making sports shoes. 1924: Foundation of Gebrüder Dassler Schuhfabrik, Herzogenaurach, Germany. 1948: After increasingly different views of how to run the business, the brothers split in 1948. Rudolf moved to the other side of the Aurach River to start his own company. Adolf started his own company using a name he formed using his nickname—Adi—and the first three letters of his last name—Das—to establish Adidas. Rudolf created a new firm that he called "Ruda", from "Ru" in Rudolf and "Da" in Dassler. A few months later, Rudolf's company changed its name to PUMA Schuhfabrik Rudolf Dassler. In the same year, PUMA’s first football boot, the “ATOM”, was launched. PUMA and Adidas entered a fierce and bitter rivalry after the split. The town of Herzogenaurach was divided on the issue, leading to the nickname "the town of bent necks"—people looked down to see which shoes strangers wore. Even the town's two football clubs were divided: ASV Herzogenaurach club supported Adidas, while 1 FC Herzogenaurach endorsed Rudolf's footwear. When handymen were called to Rudolf's home, they would deliberately wear Adidas shoes. Rudolf would tell them to go to the basement and pick out a pair of free PUMAs. The two brothers never officially reconciled. 1949: Rudolf Dassler has the idea of football shoes with removable studs. He begins working on their development and production. 1952: Rudolf Dassler developed the “SUPER ATOM”, a football boot with screw-in studs. 1958: PUMA introduced its trademark formstrip logo. 1960: PUMA is the first sports shoe manufacturer to use vulcanization. 1970: A few months prior to the 1970 FIFA World Cup, Armin Dassler (Rudolf's son) and his cousin, Horst Dassler (Adi's son), sealed an agreement which was dubbed "The Pelé pact". This agreement dictated that soccer player Pelé would be out of bounds for both Adidas and PUMA. However, Pelé complied with a request by PUMA's representative Hans Henningsen to increase the awareness and profile of PUMA after he received $120,000 to wear the Formstrips. At the opening whistle of a 1970 World Cup finals match, Pelé stopped the referee with a last-second request to tie his shoelaces before kneeling down to give millions of television viewers a close-up of his PUMA shoes. This outraged Horst, and future peace agreements were called off. 1972: Two years later, during the 1972 Summer Olympics, PUMA provided shoes for the Ugandan 400 metres hurdles champion, John Akii-Bua. After Akii-Bua was forced out of Uganda by its military government, PUMA employed him in Germany. Eventually Akii-Bua returned to Uganda. 1974: Rudolf Dassler died on October 27. Both his sons Armin and Gerd inherited the company and after a legal dispute between the two, Armin Dassler took over the company. 1976: Introduction of the S.P.A.-Technology. 1985: Boris Becker helps develop the shoe that bears his name. Martina Navrátilová is under contract with PUMA from 1984 to 1987. 1986: Transformation into a stock corporation. The company went public as “PUMA AG” was listed on the Munich and Frankfurt stock exchanges. 1989: Launch of the TRINOMIC sport shoe system. 1989: Rudolf's sons Armin and Gerd Dassler agreed to sell their 72 percent stake in PUMA to Swiss business Cosa Liebermann SA. 1990: Introduction of INSPECTOR, a growth control system for children's shoes. 1991: Launch of the DISC SYSTEM sports shoe. 1992: Capital increase by DM 20 million, share capital reaches DM 70 million. 1993: Jochen Zeitz was appointed CEO. 1994: The first profit since the company's IPO in 1986 is registered. 1996: PUMA is listed in the German M-DAX index; introduction of the CELL technology, the first foam-free midsole. 1997: Launch of the CELLERATOR. 1998: PUMA signs Serena Williams. 1999: PUMA becomes an official on-field supplier of the NFL, a legacy reflected in the numeral font of the Tennessee Titans jersey which still uses the original PUMA design. PUMA is the uniform manufacturer for both Super Bowl teams that year. 2000: Production of fireproof footwear in partnership with Porsche and Sparco. 2001: Acquisition of the Scandinavian Tretorn Group. The PUMA Speedcat is launched. 2002: PUMA ends tenure as an on-field supplier for the NFL, when Reebok is announced as the league's sole official uniform and apparel sponsor for 10 years (2002-2011). PUMA and Serena Williams unveiled the “Serena Williams Tennis Collection”. 2003: Majority shareholder Monarchy/Regency sells its shareholdings to a broad base of institutional investors. 2004: Collaborative partnership with designer Philippe Starck. 2005: Mayfair Vermögensverwaltungsgesellschaft mbh acquires a total of 16.91% shareholding. 2006: The company is listed in the Dow Jones Sustainability Index; Introduction of the S.A.F.E. concept, a specific tool developed to continuously improve social and environmental standards. Shoe collection in cooperation with Alexander McQueen. 2007: On 10 April, French retailer and owner of Gucci brand Pinault-Printemps-Redoute (PPR) announced that it had bought a 27% stake in PUMA, clearing the way for a full takeover. The deal valued PUMA at €5.3 billion. PPR said that it would launch a "friendly" takeover for PUMA, worth €330 a share, once the acquisition of the smaller stake was completed. The board of PUMA welcomed the move, saying it was fair and in the firm's best interests. Prolongation of the contract with Jochen Zeitz by five years. 2010: PUMA acquired the Cobra Golf, which was renamed as COBRA PUMA GOLF. PUMA became a carbon neutral company. 2011 PUMA becomes a European corporation under the name of PUMA SE. Franz Koch is named Chief Executive Officer. PUMA took over Bodywear and Socks company Dobotex. The company released the first Environmental Profit and Loss Account which valued PUMA’s environmental impact at 145 million Euros. 2012: Signs an eight-year deal to make kits for Borussia Dortmund, starting from the 2012-13 season. 2013: Bjørn Gulden is named as new Chief Executive Officer (CEO). 2014: PUMA and Arsenal Football Club entered a long-term merchandising partnership. 2015: Rihanna became PUMA’s global ambassador for Women’s Training as well as serving as the PUMA Women’s Creative Director. As Women’s Creative Director, she also directly influences product collections, designs and customizes classic PUMA styles as well as creates new product lines. 2016: PUMA became the Official Licensed Partner and Official Supplier of Team and Racewear to Red Bull Racing. PUMA partnered with The Weeknd as a new Global Brand ambassador and creative collaborator. ↑ "PUMA AG (PUM) | 4-traders". Retrieved 2016-11-19. 1 2 "PUMA at a Glance". PUMA. Retrieved 28 October 2016. ↑ Smit 2009, p. 31. ↑ Smit 2009, p. 33. 1 2 Lauren Milligan (16 December 2014). "Rihanna Named Creative Director Of Puma". Vogue (magazine). 1 2 3 4 "The Town that Sibling Rivalry Built, and Divided". Deutsche Welle – dw-world.de. 7 March 2006. Retrieved 6 November 2010. 1 2 3 "How Adidas and Puma were born - Rediff Sports". Rediff.com. 8 November 2005. Retrieved 2012-01-15. ↑ Smit 2009, p. 18. 1 2 "Puma AG Rudolf Dassler Sport". Fundinguniverse.com. Retrieved 6 November 2010. 1 2 initclock() (19 August 2011). "The Top Ten Shoe Companies In The World| Top Tens List| World Tens". World Tenz. Retrieved 2012-01-15. ↑ Matthews, Peter (2012-03-22). Historical Dictionary of Track and Field. Scarecrow Press. ISBN 9780810879850. 1 2 3 4 5 "PUMA® – History". about.puma.com. Retrieved 2015-09-03. 1 2 Thomas, Rob (2015-01-07). Big Data Revolution: What Farmers, Doctors, and Insurance Agents Can Teach Us about Patterns in Big Data. John Wiley & Sons. ISBN 9781118943717. 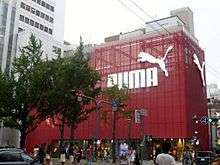 ↑ "Puma sees sharp fall in profit". BBC News. 19 February 2007. Retrieved 22 May 2010. ↑ "Puma's shares surge on bid rumour". BBC News. 5 April 2007. Retrieved 22 May 2010. ↑ "Gucci-firm PPR buys stake in Puma". BBC News. 10 April 2007. Retrieved 22 May 2010. ↑ "Koch ist neuer Puma-Chef". Focus (in German). 25 July 2011. Retrieved 3 August 2011. ↑ Passariello, Christina. "Puma Names New CEO". Wall Street Journal. ISSN 0099-9660. Retrieved 2015-09-03. ↑ Byrne, +Bryan. "Puma King XL 40th Anniversary Edition". Soccer Cleats 101. Retrieved 2015-09-03. ↑ "Puma King XL Italia Review". Soccer Cleats 101. 6 January 2010. Retrieved 2012-01-15. ↑ "Puma King Diego". Soccer Cleats 101. 14 December 2010. Retrieved 2012-11-11. ↑ "Eliminating Child Labour from the Sialkot Soccer Ball Industry" (PDF). greenleaf-publishing.com. Retrieved 12 November 2010. ↑ Puma, Puma releases 2007–2008 Sustainability Report, 2009. Retrieved 20 January 2011. ↑ Ethical Clothing Australia, Accredited sports brands. Retrieved 20 January 2011. ↑ Jo Confino (16 May 2011). "Puma world's first major company to put a value on its environmental impact". The Guardian. ↑ Ramachandran, Arjun (18 September 2009). "Town divided by tale of two shoes". Sydney Morning Herald. Retrieved 6 November 2010. ↑ "The hatred and bitterness behind two of the world's most popular brands". Fortune. Retrieved 2015-09-03. ↑ "SFMOMA | SFMOMA | Explore Modern Art | Our Collection | PUMA | About". San Francisco Museum of Modern Art. Retrieved 2015-09-03. ↑ "PUMA® – PUMA rewriting football history". about.puma.com. Retrieved 2015-09-03. ↑ "Puma Football and Basketball Uniforms". Retrieved 2015-09-03. 1 2 3 "History of Puma AG Rudolf Dassler Sport – FundingUniverse". www.fundinguniverse.com. Retrieved 2015-09-03. ↑ Smit 2009, p. 82. ↑ "The John Akii Bua Story: An African Tragedy". SpeedEndurance.com. Retrieved 2015-09-03. ↑ "PUMA® – PUMA is a European Corporation". about.puma.com. Retrieved 2015-09-03. ↑ "Killing It In Running Science For Over 80 Years - 1989: The Trinomic Sole: PUMA's Most Advanced Tech Yet". Retrieved 2015-09-03. ↑ "Jochen Zeitz | Kering". www.kering.com. Retrieved 2015-09-03. ↑ O'brien, Kevin J. (2004-03-12). "Focusing on Armchair Athletes, Puma Becomes a Leader". The New York Times. ISSN 0362-4331. Retrieved 2015-09-03. ↑ "Quaker City Mercantile: News & Press - Puma Launches New Marketing Strategy". quakercitymercantile.com. Retrieved 2015-09-03. ↑ "Reebok, NFL try fresh start - SportsBusiness Daily | SportsBusiness Journal | SportsBusiness Daily Global". m.sportsbusinessdaily.com. Retrieved 2015-09-03. ↑ "Monarchy Regency sells its stake in Puma - New Europe". Retrieved 2015-09-03. ↑ "PUMA® – PUMA Announces Collaboration with Philippe Starck". about.puma.com. Retrieved 2015-09-03. ↑ "PUMA® – Mayfair acquires a stake in PUMA". about.puma.com. Retrieved 2015-09-03. ↑ "PUMA® – PUMA becomes Industry Leader in Dow Jones Sustainability Index". about.puma.com. Retrieved 2015-09-03. ↑ Puma. "PUMA(R) Announces Collaboration with Alexander McQueen -- LONDON, May 31 /PR Newswire UK/ --". www.prnewswire.co.uk. Retrieved 2015-09-03. ↑ "PUMA® – PUMA welcomes PPR as its new strategic shareholder and its voluntary take-over offer". about.puma.com. Retrieved 2015-09-03. ↑ "PUMA® – Contract with PUMA's CEO Jochen Zeitz extended ahead of schedule". about.puma.com. Retrieved 2015-09-03. ↑ Energy, We Are. "Jack Wolfskin Appoints Melody Harris-Jensbach Chief Executive". snowindustrynews.com. Retrieved 2015-09-03. ↑ "Hussein Chalayan Appointed Creative Director of Puma". www.adweek.com. Retrieved 2015-09-03. ↑ "Puma acquires Cobra Golf". 10 March 2010. Retrieved 11 March 2010. ↑ Bäumer, Matthias (26 August 2012). "Borussia Dortmund agree an eight-year deal with Puma in a lucrative deal with the German club". London: Football Shirt Maker. Retrieved 2011-10-26. ↑ "Arsenal announce £150m deal". London: Your Daily Arsenal. 8 May 2013. Retrieved 2013-05-11. ↑ David Siders. "Rhianna Gamechanger". UK Puma. Retrieved 4 June 2014. Smit, Barbara (2009). Sneaker Wars. New York: Harper Perennial. ISBN 978-0-06-124658-6. "Puma AG Rudolf Dassler Sport". Fundinguniverse.com. Retrieved 6 November 2010.